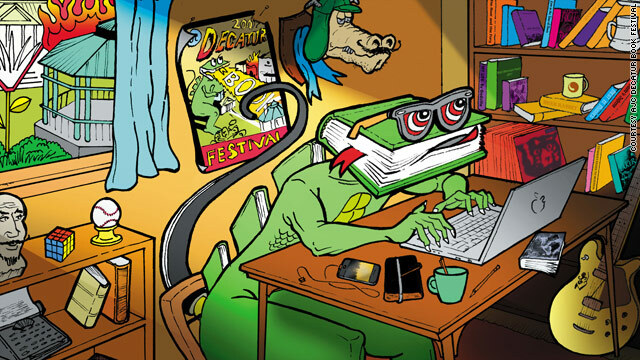 Bookzilla, the Decatur Book Festival mascot, is looking mighty hungry...for knowledge? Atlanta’s Dragon*Con might be the nerdly epicenter of the weekend, but for those of you in town, there’s a rumble of something geeky six miles to the east. The Decatur Book Festival is an annual Labor Day weekend gathering of 50,000 book lovers and literary types just outside Atlanta. It can’t compete with the fan-and-costume overload of Dragon*Con, but it has a Faulkner-quoting monster named Bookzilla for a mascot, so that counts for something. What counts for more: Among its lineup of best-sellers, romances and kidlit, there’s a block of fantasy, sci-fi and horror authors, including some Dragon*Con guests like “Hellhole” co-author Kevin J. Anderson and steampunk-anthologizing authors Ann and Jeff VanderMeer. Here's the entire book festival schedule, if you need to break away from the superheros and sportsfans crowding downtown Atlanta this weekend. Most festival events are free. Translation: At what book festival can you expect readers to show up dressed like Stormtroopers and Hogwarts students? Only one sharing a city and weekend with Dragon*Con.